Muiri is a Breton apothecary. She grew up in Windhelm with her best friend Nilsine Shatter-Shield. After Nilsine's sister Friga Shatter-Shield was killed by the Butcher of Windhelm, Muiri met and began a relationship with Alain Dufont. However, he was just using her to get close to the Shatter-Shield Clan and steal their valuables, including the family heirloom Aegisbane. The Shatter-Shield Clan blamed Muiri for this and forced her out of Windhelm and onto the streets. 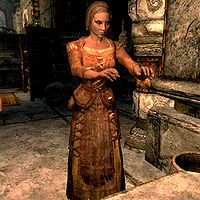 Muiri eventually ended up in Markarth, where she started working as an assistant to Bothela at the Hag's Cure. Bitter at the betrayal by Alain Dufont and being abandoned by Nilsine Shatter-Shield, she performs the Black Sacrament and requests that the Dark Brotherhood kill Alain. Starting from midnight Muiri will sleep at the Hag's Cure until 6am, she will then have breakfast for an hour before returning to bed for an hour. Work then begins for Muiri at the Hag's Cure from 8am through till 1pm, where she takes a one hour lunch break, then returns to work until 7pm. From 7pm till midnight she leaves the Hag's Cure to enjoy a 5 hour meal, after which she will return to the Hag's Cure to sleep. Muiri wears a set of farm clothes, including a pair of boots. She is equipped with an iron dagger and has a copy of the key to the Hag's Cure. She also carries common loot and a small amount of gold. As Muiri was trained by Bothela, she knows all of the same spells she does. From the Conjuration school, she has access to Conjure Familiar; from the Destruction school she has Flames; she can also use the Healing spell from the Restoration school. 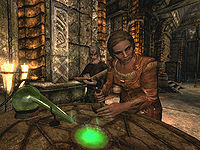 During her related quest, opting to also kill Nilsine Shatter-Shield yields an additional reward: Muiri's Ring, an enchanted ring that increases your alchemy skill such that potions created when it's worn will be 15% stronger. Muiri also becomes available for marriage if you complete the optional objective. She will often complain and wonder "Why can't the men in this city just leave me alone?" Muiri will have several conversations with Bothela about her continuing education, Muiri's life issues, and about Bothela's family. Bothela: "No, no girl. It's the pickled spider tongue and then the decayed taproot. Do it the other way, and your cure turns into a poison." If Bothela dies, Muiri becomes the new merchant. If you choose to destroy the Dark Brotherhood, you can still marry her if Bothela is killed and you invest with Muiri after she takes over the shop. However, killing Bothela yourself will lower Muiri's disposition. Completing the Mourning Never Comes quest will trigger new dialogue in which she hesitantly thanks you for solving her "problem". However, the dialogue does not disappear if you marry her. If affected by Muiri's dialogue bug noted above, and you have not yet completed the Dark Brotherhood questline, it may make you unable to complete the quests given by Astrid. ? PC users can fix this by using the console command resetquest DB03, which removes the completion of Mourning Never Comes. Note that doing this may cause problems when trying to speak with Nazir. This page was last modified on 26 January 2018, at 18:29.